The Auray Zoom H6 Value Pack is a B&H kit that provides you with all the essential accessories you need to start using your portable recorder. 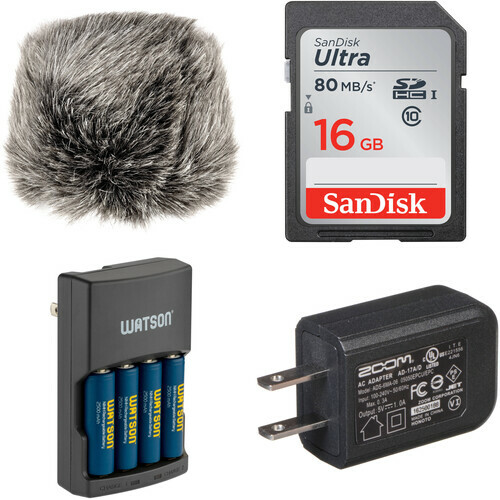 The kit comes with an Auray Custom Windbuster, 16GB SDHC Memory Card, 4-Hour Rapid Charger with 4 AA NiMH rechargeable batteries, and an AC-17 AC Adapter. The Auray WRW Series Custom Windbusters provide dual layered wind protection and are designed to substantially reduce unwanted broadband wind noise and vocal pops with minimal high frequency loss. This WRW-H2N Custom Windbuster has been tailor-made to fit the Zoom H2n and is designed to be used either on its own or over a foam windscreen. It also fits the Zoom H5 and H6 X/Y Mic over its existing foam windcreen. The simulated fur outer layer works in tandem with the acoustic cloth inner lining to protect the microphone element from air bursts without muffling the sound. When used on the Zoom H2n, this windbuster is effective in minimizing wind noise and plosive sounds. It is most effective in light breeze to moderate breeze conditions (4-17 mph) and users can generally expect a 20dB to 30dB reduction in wind noise with modest dampening of high frequencies. For most applications, the modest high frequency dampening is a worthwhile exchange for the substantial wind noise reduction. In addition to dual layered wind protection, the WRW-H2N helps prevent moisture and dirt from damaging your recorder's microphone. The windbuster is designed to fit the Zoom H2n recorder. The WRW-H2N Custom Windbuster for the Zoom H2n digital recorder offers an extremely effective dual layered solution for wind protection. Power up your photo equipment, flashlights, gaming devices, and other electronics via the Watson MX 4-Hour Rapid Charger with 4 MX AA NiMH Batteries. The 1.2V, 2550mAh nickel-metal hydride cells are pre-charged, rechargeable up to 500 times, and capable of retaining 85% of their capacity after 1 year in storage. The Rapid unit will charge 4 of them in about 310 minutes, or 2 in about 160 minutes. It's also compatible with optional AA NiCd batteries, or AAA NiMH or NiCd cells. The charger's integrated micro-controller ensures that each battery is charged to its full capacity, and an automatic cut-off feature prevents overcharging. Should the controller and automatic cut-off functions both fail, the safety guard timer will kick in to ensure that power is still shut off after 6 hours. Additionally, the charger features protection against short circuits and reverse polarity. Two charging channels are individually monitored, and two LED indicators display battery status. In order to enable use all over the world, the charger runs on 100-240 VAC power. As a bonus, its compact outlet prongs can fold inwards, making the unit more compact for storage and travel. The AC-17 AC Adapter from Zoom is used to power the R8, H6, H2n, H1, H3-VR & Q2HD Recorders. Note: Note: This is a replacement adapter for R8 Recorder and separately sold accessory for the H6, H2n, H1, and Q2HD Recorders. Box Dimensions (LxWxH) 4.7 x 2.5 x 1.1"
Box Dimensions (LxWxH) 7.8 x 4.1 x 0.4"
Box Dimensions (LxWxH) 3.5 x 2.1 x 1.8"